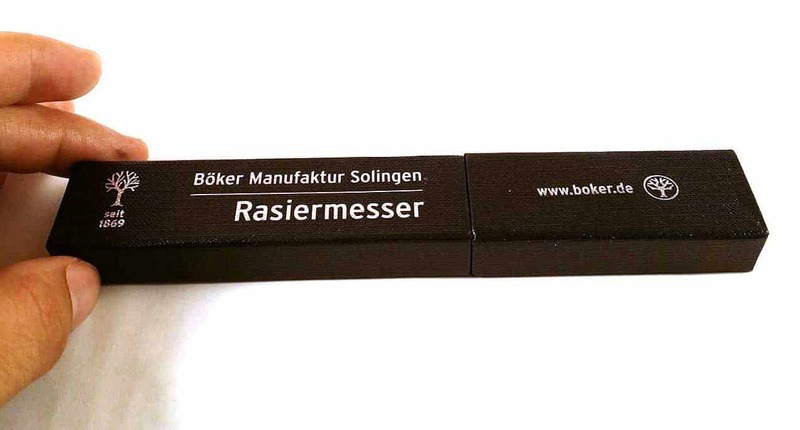 Produced in Solingen, Germany, the so-called ‘steel capital of the world,’ Böker is one of the well-respected names in the straight razor game. The company also happens to be one of my top three favorites, alongside Thiers-Issard and DOVO (the latter of which are also produced made from world famous Solingen steel). I’ve owned a Böker straight razor for more than ten years, which I picked up in Germany as a fresh faced 19 year old after watching my Dad shave with one all throughout my childhood. Although it definitely took some time before I was fully confident using it, I still shave with it whenever I feel like getting a super close, smooth shave. However, I must admit that now I generally wear a beard, and when I do shave, I typically use a safety razor for the ease and convenience of it. Still, a few months back, I decided that with the summer season rapidly approaching, it was time to undertake my yearly ritual and shave off my beard until the frigid temperatures forced me once again to cover my face. With you, our valued Prim&Prep visitors in mind, I thought I would take the opportunity to see how a Böker USA razor stacked up to my original German version. With that in mind, I went on Amazon and decided to purchase the Böker USA King Cutter, as this was the most well reviewed one I could find. I was also pleasantly surprised to find that this razor was quite a bit cheaper on Amazon than on most other sites (about $50 cheaper to be exact), so I took the plunge in order to provide you with my honest, up to date Böker straight razor review. Although this Böker straight razor review is based on the Böker USA King Cutter, it could really apply to most razors the company produces, as they all seem quite similar in terms of overall quality, durability and price. One of the main reasons I decided to purchase a new razor to base my Böker straight razor review on, instead of simply using my older German made one, was that I wanted to see whether there were any noticeable differences between the two. I also thought that, as my razor was more than a decade old, it would make for a more accurate review if I used a brand new razor straight out of the box. This way I could provide more information on how it was to sharpen and hone the new razor. After doing a bit of research, I found out that Böker USA razors are manufactured at a facility in Denver, Colorado, which had me slightly concerned, as the main reason the company is so popular is the fact that they use Solingen steel. Upon receiving my Böker USA King Cutter, I was pleased to see that the word Solingen was still stamped upon the steel, just as it is with my old German version. This means that the steel is forged in Germany and then sent on to the US to be assembled, which already had me feeling more confident about my purchase. Not that I have anything against US steel, its just that Solingen steel is known to be the cream of the crop. The first test for any straight razor is how sharp it can get. If you’re familiar with straight razors, you likely know that most any razor, even those sold as ‘shave ready,’ will require at least a bit of honing before it is truly ready to use. Upon opening the package, I was actually quite surprised to find out how sharp this thing already was, but I knew it still needed a bit of finishing touches before it was ready to shave with. After getting out my hones, I polished that baby up to a 20k hone. This already had me excited about shaving with it, as I knew the steel had to be of the highest quality in order to hold this fine of an edge. After finally getting it honed, stropped and ready to use, I trimmed up my beard as short as I could, lathered up and fell in love with the first stroke. What else can I say but that this was one of the more enjoyable, closest shaves I’ve had in a long time. Although it did take me a bit of time to hone it before that first shave, the steel in the King Cutter holds an edge just as well, if not better than my original German made Böker. This is because the newer model uses a special steel alloy that allows it to be ground down to an incredibly fine edge and will hold that edge like a champ if taken care of properly. It’s now been several months that I’ve periodically been using my King Cutter and I’m still as happy with its sharpness as I was on that first shave. For that reason, it deserves outstanding marks for this category. In terms of durability, it’s important to discuss two separate aspects in this Böker straight razor review. The first thing I’ll look at is the durability of the steel. As the steel is still forged in Solingen, you can be confident that you’re getting a razor produced with some of the highest quality steel around (only Japanese made steel can really compete). If taken care of properly, the steel used for Böker razors shouldn’t just last for decades, but most likely for generations, meaning these things could easily turn into a family heirloom. However, it’s not all roses, as the scales (the part you hold on to) are made of a lightweight, somewhat cheap feeling plastic. Unfortunately, Böker is not alone in this, as plastic scales seem to be quite common even amongst the top brands. Nonetheless, while the handles neither look nor feel very stylish or sturdy, I’ve yet to come across a review that mentions any problems with the scales breaking (unlike the plastic scales on some DOVO models). That being said, the plastic scales (I chose the black model, as it was cheaper, but white plastic scales are also available) did cause the King Cutter to lose just a few points in terms of durability. Otherwise, if it weren’t for the scales, I would have considered giving this razor a top grade in terms of durability. While I’ve not yet had a chance to try it, I’ve been told that the moisture resistant synthetic handle found on the Böker Arborito is a huge improvement over the lighter plastic scales—although this particular razor also costs around $100 more than the King Cutter. No straight razor is particularly easy to use if you don’t already know what you’re doing, so it’s important to consider this category only as it relates to other straight razors. 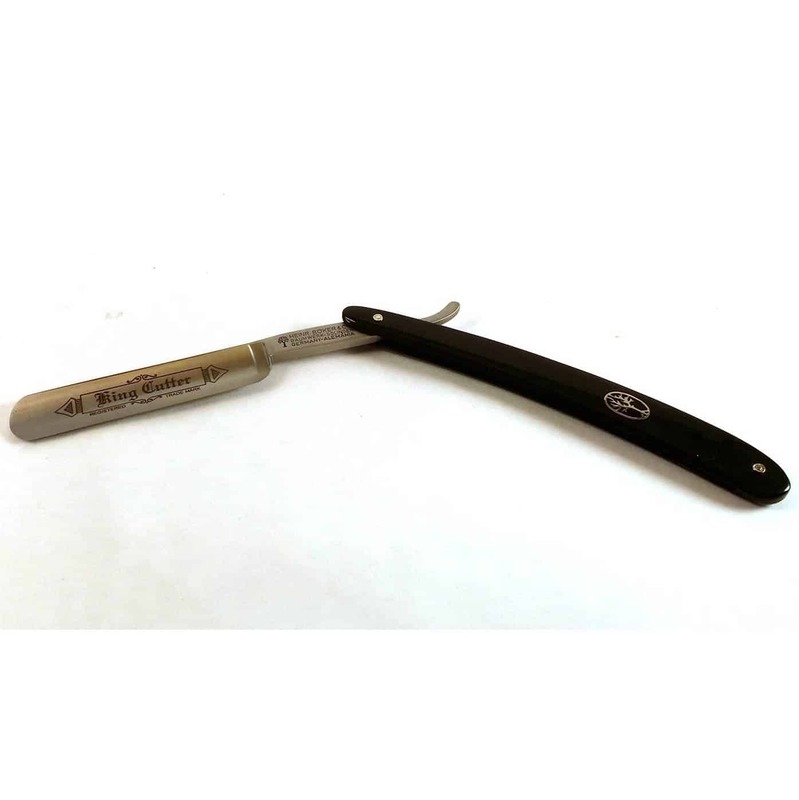 This particular model features a 5/8″ wide blade, which is what is generally recommended for newbies, as it is much easier to maneuver than the wider 6/8″ blades, which are generally recommended only for experienced straight razor shavers. 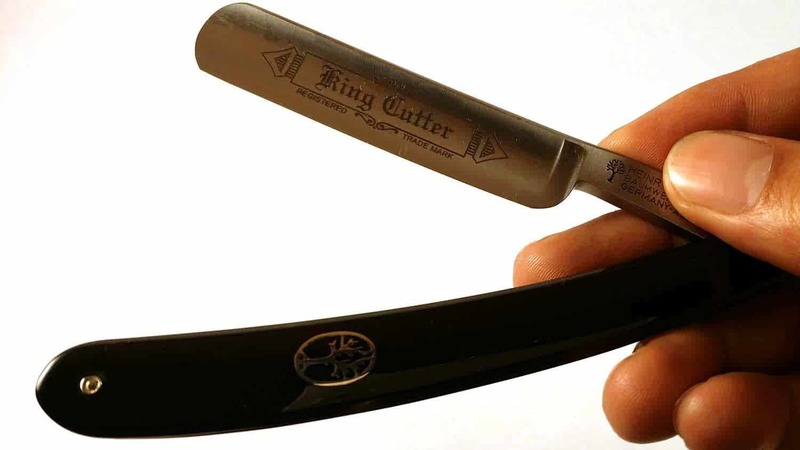 The King Cutter also features a rounded blade, which again makes it better for beginners. While square point blades are a bit better at cutting fine lines or getting into those tight places, they also make it a heck of a lot easier to not only cut yourself, but cut yourself badly. Similarly, this razor also features a half hollow ground blade. This again lessens the chances of serious cuts compared to the thinner full hollow ground blades, although a full hollow razor will generally provide a much closer shave. Overall, in terms of ease of use, the King Cutter deserves a fairly high grade, as it is not only a great razor for newbies to learn with, but it also packs enough punch for more experienced shavers like myself. The only thing that lowered the score slightly was the weight and balance of the razor, as I found it to be a bit lighter and not as well balanced as others I’ve used. The main problem again lies with the plastic scales, which I find to be a bit too light and generally throw off the balance slightly. Still, I’ve again heard that this isn’t as much of a problem with the Böker Arborito. For some reason, Böker razors have developed a bit of a reputation for being overpriced, which I really don’t find fair. Sure, the King Cutter may cost over $100, but really, I wouldn’t recommend using a razor that sold for anything less than that, as high quality steel is simply expensive to produce. While there are definitely cheaper razors out there, I think you’d be hard pressed to find a better quality one for less than what the King Cutter costs. For this reason, it fully deserves quite a high score in this category as well. Don’t just take our word for it, check out all the other glowing user reviews here. While I would be hesitant to make outlandish claims, there is no doubting that this is definitely one of the best straight razors out there for its combination of price and quality. Sure, the plastic scales leave a bit to be desired, but if you’re looking for a good razor and don’t want to spend $200-300, you could definitely do a lot worse than the Böker King Cutter. Overall, the quality of the steel more than justifies the price, making this razor well deserving of an inclusion on any list of the best straight razors. Of course, if your looking for that traditional quality wet shave but may not be ready to make the leap to the straight razor, there is always the safety razor. Check out these articles: safety razor vs straight razor and the top safety razors for more information.